Mother’s Day Special Promo: Awakenings Signature Facial and Massage in Leesburg, VA just for Moms! Make this Mother’s Day celebration extra special with Awakenings’ exclusive Mother’s Day Special promo. Treat her like a queen with an indulgent facial and massage in Leesburg, VA! For Mother’s Day, we’ve bundled together two of our most popular facial and massage services – the Awakenings Signature Facial and Awakenings Signature Massage. These packages are designed to melt away the stress of the amazing moms in your life and boost their natural radiance. Awakenings Signature Facials in Leesburg is a beauty treatment like no other. It’s perfect for all skin types, and begins with a soothing steam to open up the pores. After a deep double cleanse, impurities will be extracted from the skin to leave it feeling clean from the inside out. Mothers will be treated to a relaxing shoulder, neck, and facial massage followed by a calming, hydrating facial serum. The skin therapy is finished off with a nourishing moisturizer and post-care instructions for a lasting Mother’s Day glow. Express your gratitude for your mother’s unconditional love and inspiration with the delightful Awakenings Signature Massage. It combines classic Swedish massage with deep tissue stimulation to pamper her body and balance her energies. During the massage, she’ll be surrounded by sweet fragrances from therapeutic grade essential oils. This aromatherapy is intensified by hot towels to promote total relaxation, reduce stress, and give her a renewed sense of well-being. As a gift, Awakenings’ Mother’s Day Special comes with a skin care sampler goodie bag so they can take home the fabulous spa experience. Just for the holiday, you can avail of this facial and massage combo for $159 (regular price: $190). This special offer is available from April 15 through Mother’s Day, so you can schedule your Mother’s Day spa visit any time – or several times! Give your mom the royal treatment she deserves – Book our Mother’s Day Special today! We also offer airbrush spray tanning services and waxing in Leesburg, VA! Come visit Awakenings Spa Boutique in the heart of historic downtown Leesburg, or call us at (703) 728-6508 to book an appointment. https://awakeningsspaboutique.com/wp-content/uploads/2019/04/Benefits-of-Awakenings-Signature-Massage-min.jpeg 5502 3668 Awakenings https://awakeningsspaboutique.com/wp-content/uploads/2016/04/Awakening-Massage-Logo-300x186.png Awakenings2019-04-23 17:10:362019-04-23 17:11:58Mother’s Day Special Promo: Awakenings Signature Facial and Massage in Leesburg, VA just for Moms! 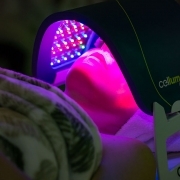 Skincare in Leesburg, VA just got even more amazing – you can now pamper yourself with Celluma Low Light Therapy to look younger, banish wrinkles, beat acne, and even pain relief! What is Low Light Therapy? Low light energy panels were originally devised by NASA and later on approved by the FDA as an effective treatment for many skin and musculoskeletal conditions. Based on this scientific research, the Celluma LED light panel was designed for the aesthetics field. Celluma LED low lights are used to improve skin tone, decrease inflammation, kill acne bacteria, stimulate tissue repair, enhance skin texture and clarity, and speed up acceleration. In addition, it’s also an excellent way to get relief from painful conditions like arthritis, stiffness, and joint and muscle pain. These fantastic benefits make Low Light Therapy a natural addition for top spas in Leesburg, VA. Tired of the usual facials in Leesburg? Low Light Therapy may just be the skin breakthrough you’ve been looking for! Celluma Light Therapy is free from harmful UV rays, abrasive chemicals, and unpleasant side effects. It’s non-invasive and non-toxic, and so safe for the skin that it’s gentle enough to treat teenage acne! Low light therapy can help reduce the appearance of wrinkles and fine lines. It also enhances smoothness, quality, and skin texture. Light energy stimulates the fibroblasts to increase elastin and collagen, two critical components of youthful and soft skin. Acne can be a tough skin condition to beat, but Celluma Light Therapy can help. Acne is caused by the build-up of bacteria, dead skin cells, and other pollutants inside the pores. Celluma Light Therapy destroys these bacteria to help clear up existing blemishes, reduce redness and inflammation, and prevent future breakouts. When added to a balanced skin care regimen, Celluma Light Therapy offers a way out of the acne cycle. Aside from skincare, Celluma Light Therapy is also scientifically-proven to help ease muscle and joint pain. Low light energy restores vitality to compromised cells. Its powerful wavelengths penetrate deeply to boost cellular energy, which encourages tissue repair, circulation, decreased inflammation, and overall pain relief. Celluma Light Therapy is Now Available in Leesburg! Anti-Aging Facial w/ LED Low Light Therapy – only $119! We also have other skin therapy treatments such as the Oxygenating O2 Lift, Enzyme and Chemical Peels, Back Facials, Microdermabrasion, and more. Awakenings Spa Boutique has everything you need for whole-body wellness. Visit us for the best massage, yoga, facial treatments, and spray tan in Leesburg, VA! Awakenings Massage is mobile! Call Awakenings for prices and availability for your location. Discount packages are also available. Discount packages are also available.